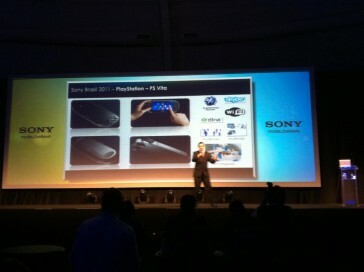 A presentation given by Sony in Sao Paulo, Brazil seems to indicate that the PlayStation Vita will support Skype. And its a good think since even the original PSP supports Skype – it would be a shame for the PS Vita to drop this functionality. The image below shows the Skype logo on the top right of the screen. Although Sony hasn’t officially announced Skype support, this image means the portable console will most likely get Skype support. Since the PS Vita features two cameras, these are likely to be utilized when making Skype calls. The original PSP version of Skype only supported voice calls. Skype was recently purchased by Microsoft but they have said they will ‘continue to invest in and support Skype clients on non-Microsoft platforms’.